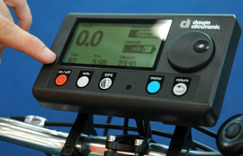 Daum Electronic GmbH from Fürth in Germany is specialized in ergometers, fitness, and training equipment and has now presented a new e-Bike/pedelec drive system that integrates GPS and GSM in addition to pulse measuring and classic functions of a bike computer. It comes with an SD-/SDHC-card reader, which allows the user to update the software via SD card and save his or her personal tour and riding profiles, modify them at the computer. The cockpit offers a lot more functions including anti-theft protection. Daum Electronic e-Bike drive system with the premium version of the system providing GPS and GSM just entered the market.